On September 14, the PESA Emerging Leaders Committee hosted its bimonthly leadership forum with PESA Board Member Richard Alabaster, President – Surface Technologies, TechnipFMC. 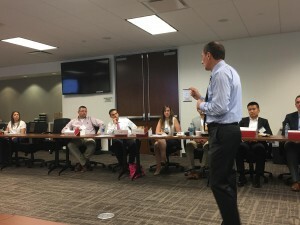 Leadership forums allow member company high performers to interact with industry executives through open dialogue structured around a targeted theme. In this forum, Alabaster shared his insights on becoming and being a leader. Be passionate – get some charisma! You will be called upon to arbitrate and decide. Always do so in line with the vision & strategy, don’t be arbitrary! Always explain citing the vision & strategy – don’t be perceived as arbitrary! If something in your vision & strategy isn’t working, change it! "It is a leader's responsibility to develop strong vision and strategy, and to make sure all efforts tie back to those fundamental principles,” Alabaster said.